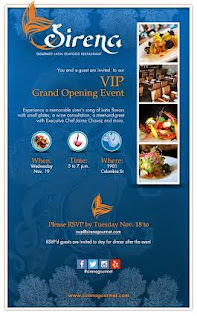 Sirena Grand Opening next Wednesday! - San Diego Dining Dish! Sirena Grand Opening next Wednesday! Next Wednesday is the grand opening for Sirena in Little Italy. I'll be there, will you? RSVP to the address on the poster below!